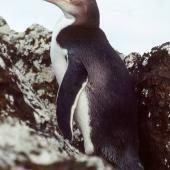 Geographical variation: The extinct Richdale's penguin M. a. richdalei was a small subspecies confined to the Chatham Islands. 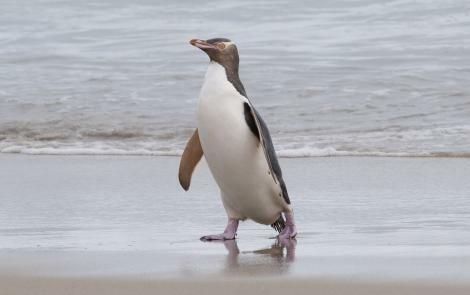 Some authorities treat Waitaha penguin as a subspecies of yellow-eyed penguin. 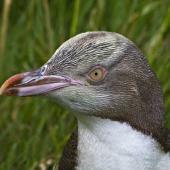 Populations of yellow-eyed penguins on the New Zealand subantarctic are genetically distinct from those in the South Island, including Rakiura/Stewart Island and surrounding islands. 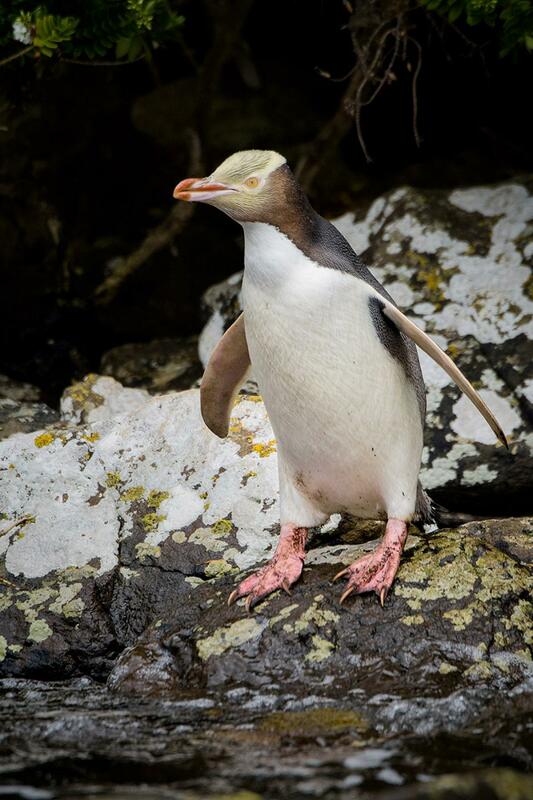 The largest of the penguins breeding on the New Zealand mainland, the yellow-eyed penguin has become a flagship species for nature-based tourism in the southern South Island. 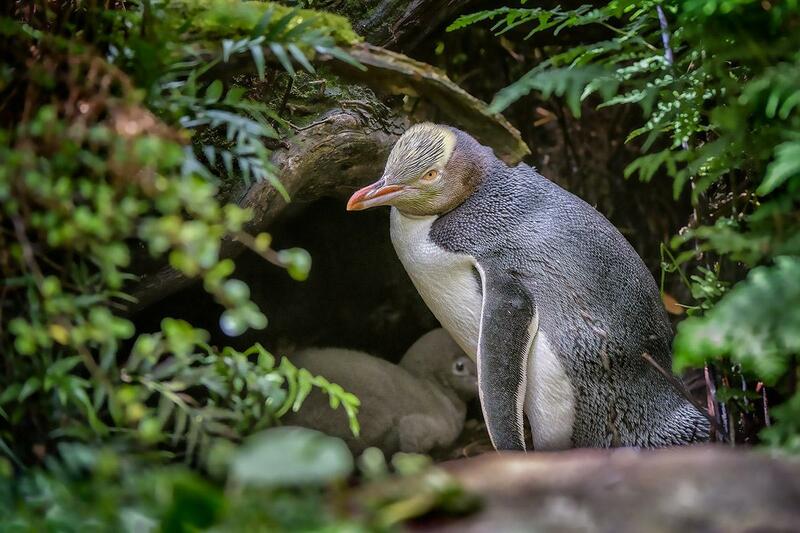 Recent research has revealed the presence on the South Island of a sister species, the Waitaha penguin Megadyptes waitaha. 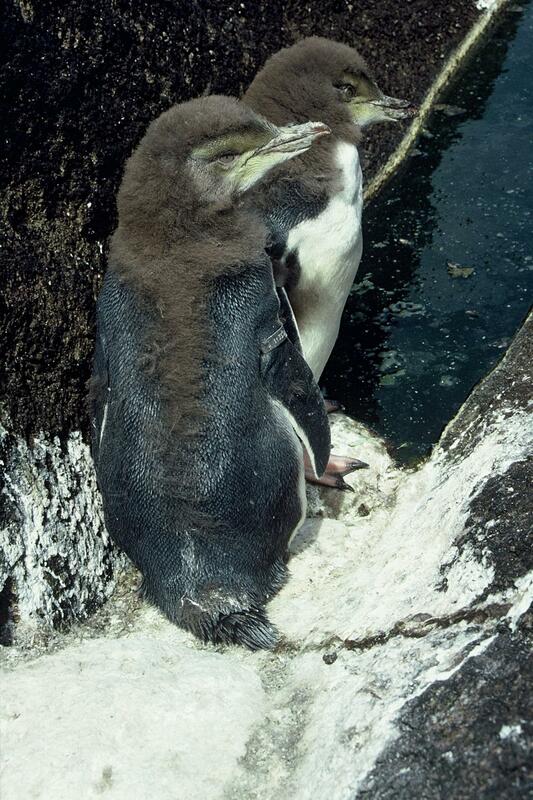 Up until c.1500 AD, yellow-eyed penguins were restricted to Auckland and Campbell Islands, while the mainland was occupied by Waitaha penguins, and a smaller form (Richdale's penguin M. antipodes richdalei) was found on the Chatham Islands. 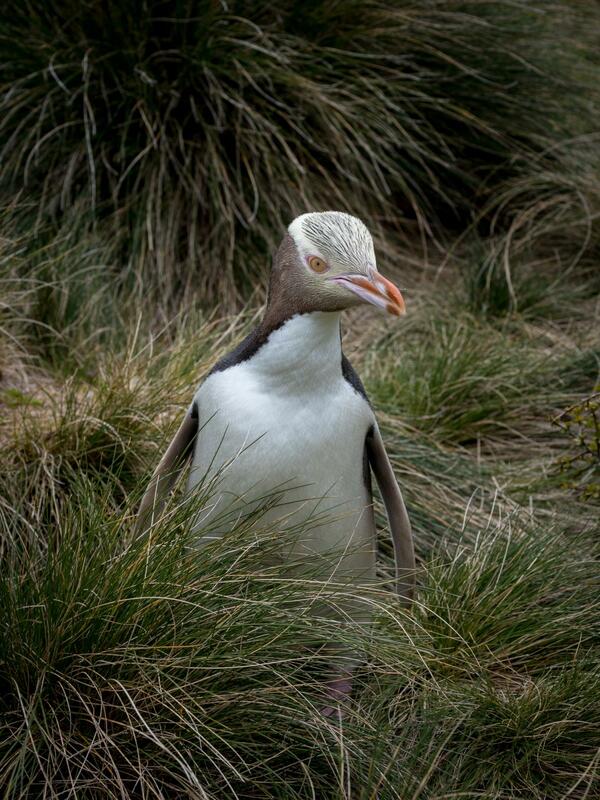 It is thought that Waitaha and Richdale's penguins were harvested to extinction. 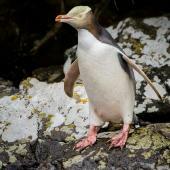 The disappearance of Waitaha penguin enabled straggler yellow-eyed penguins from the subantarctic to establish on the mainland, where human-induced extirpation of large marine mammals allowed them to expand into the population we see today. 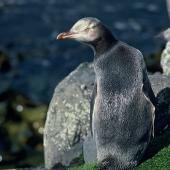 The endemic yellow-eyed penguin is now the only extant member of the genus Megadyptes. 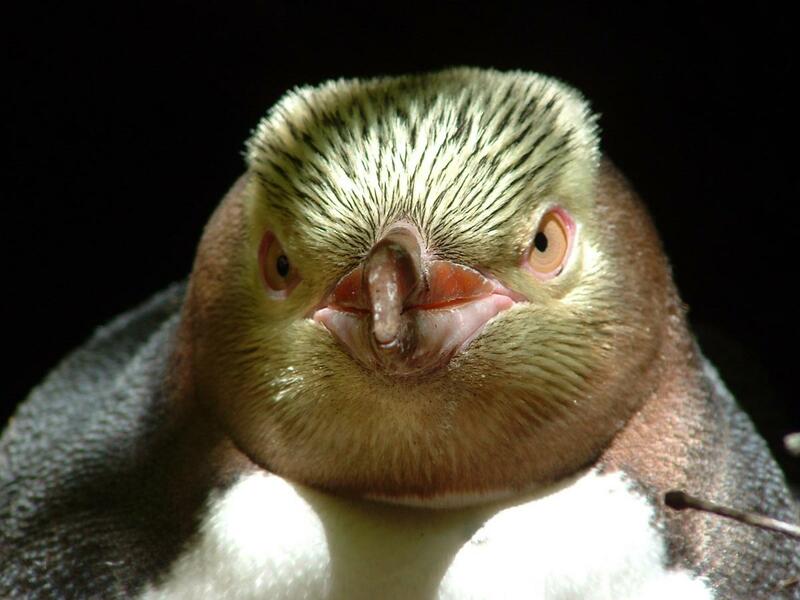 The yellow-eyed penguin is a tall, heavy penguin with a distinctive pale yellow uncrested band of feathers passing across the nape and around the eyes. 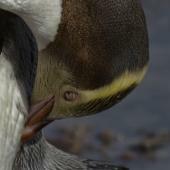 The forecrown, chin and cheeks are black flecked with yellow, the sides of the head and the foreneck are a light fawn-brown, and the back and tail are slate blue. 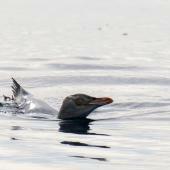 The chest, belly, front thighs, and the underside of the flippers, are white. 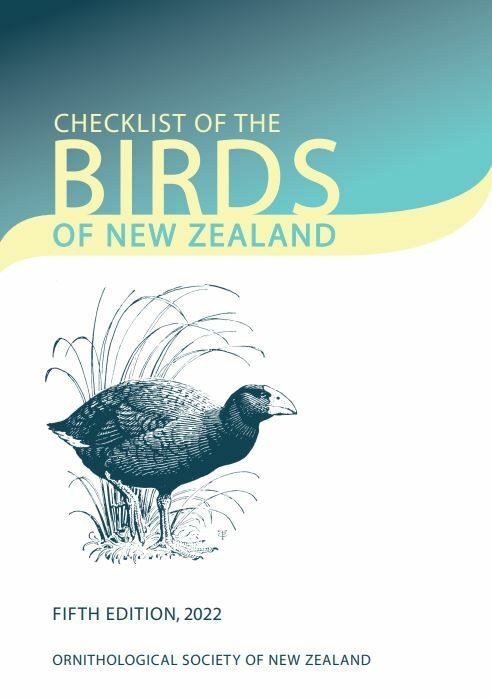 The red-brown and pale cream bill is long and relatively slender. The eyes are yellow, and the feet pink dorsally and black-brown ventrally. 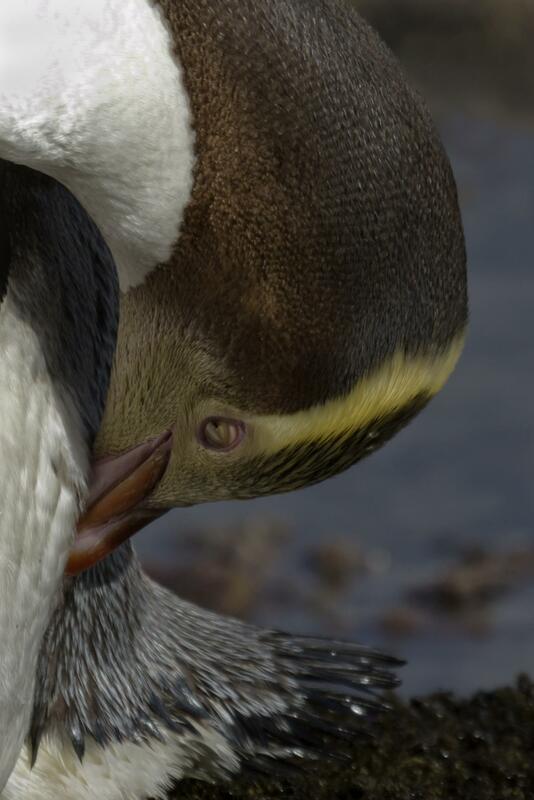 Juveniles lack the pale yellow band and have a paler eye and paler back of the head. 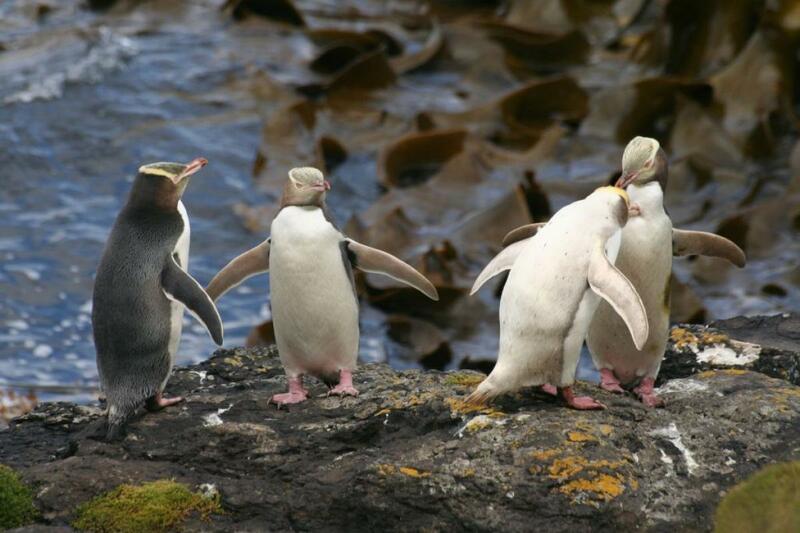 Sexes look alike; males are larger than females. 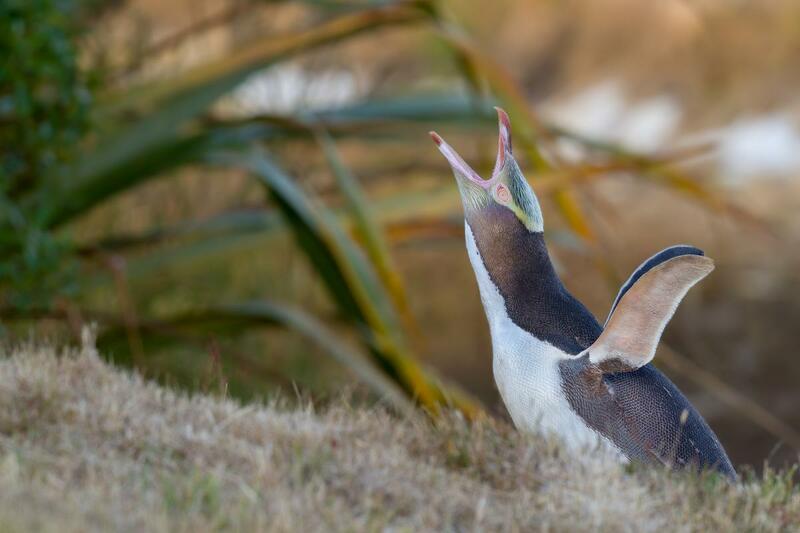 Voice: mostly silent, but at nest site gives a loud bray, similar to crested penguins but higher pitched and more tremulous. 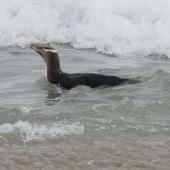 There are no similar species; the distribution, and the size, and particularly the colouration of adults is unmistakable, even in moult. 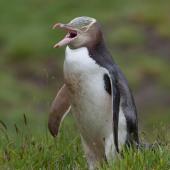 Yellow-eyed penguins breed on the southeast coast of the South Island, on Stewart Island and adjacent islands, and in the subantarctic on the Auckland and Campbell Islands. 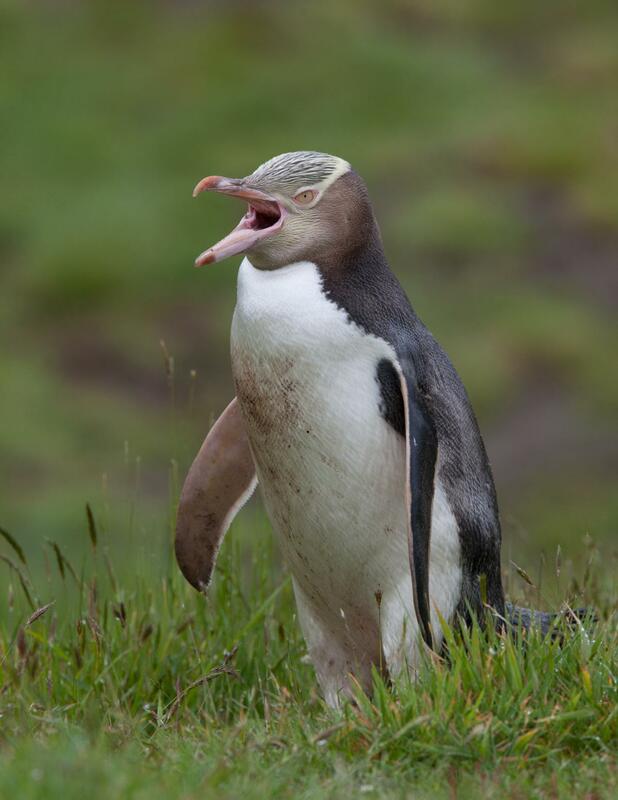 On the mainland, yellow-eyed penguins breed in four distinct breeding regions: the Catlins, Otago Peninsula, North Otago and Banks Peninsula. 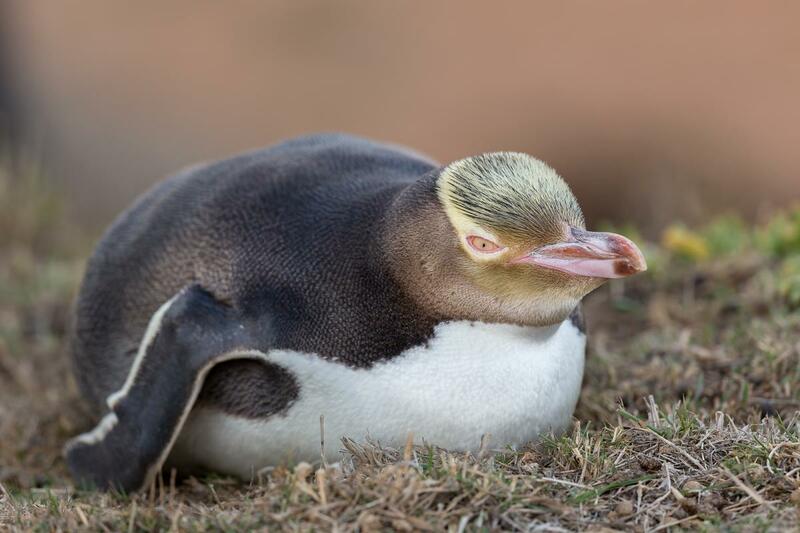 The few pairs on Banks Peninsula usually breed with little success, and recruitment appears to come from more successful breeding areas further south. 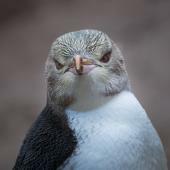 On Stewart Island, yellow-eyed penguins breed along the northeastern and eastern shores, and on several offshore islands. 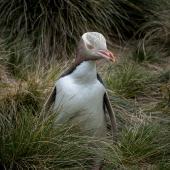 Vagrants have reached the North Island as far north as the Bay of Plenty, Chatham Islands and Snares Islands. 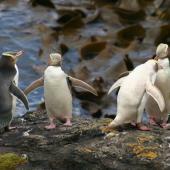 The subantarctic and mainland New Zealand populations are genetically distinct. 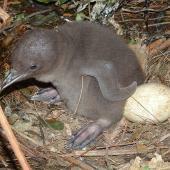 An extinct smaller subspecies (Richdale's penguin) was formerly found on the Chatham Islands. 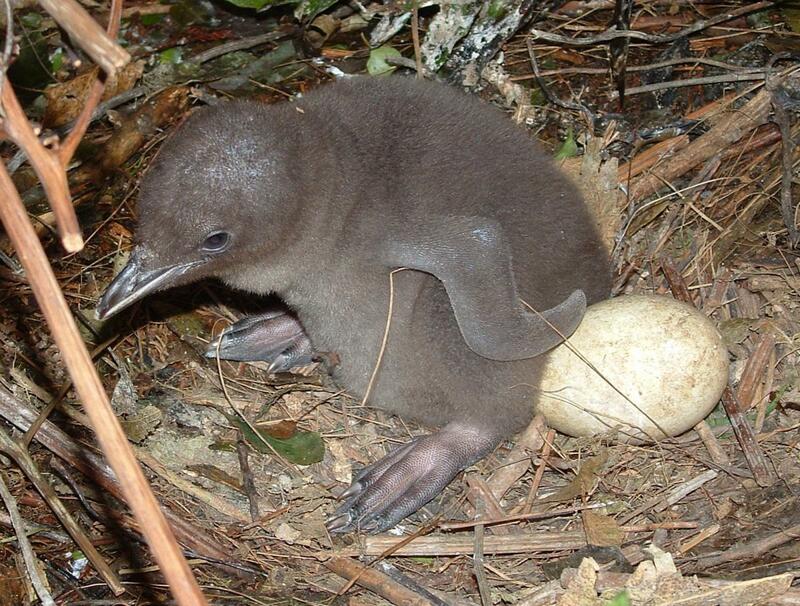 The present-day distribution of yellow-eyed penguin breeding sites corresponds to the pre-European distribution of cool coastal hardwood forest. 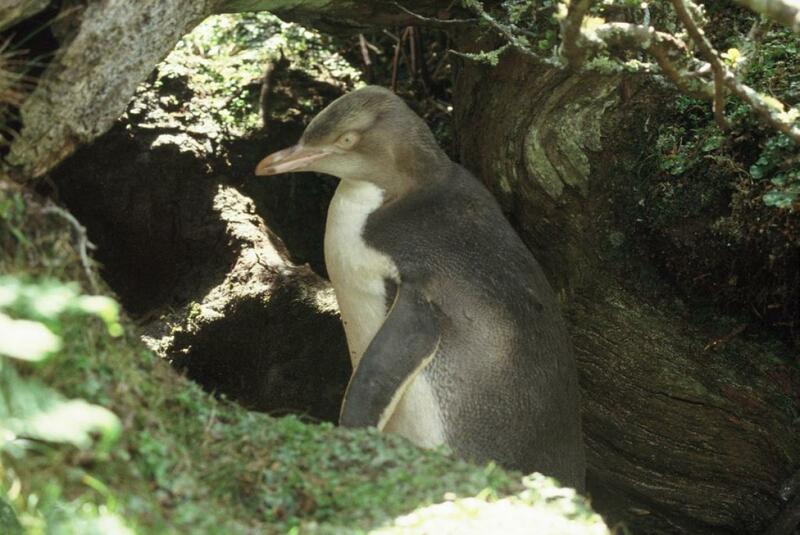 Currently, breeding occurs in mature coastal forest, regenerating coastal scrub, but also in pasture, windbreaks of planted exotic trees, and on relatively exposed cliffs. 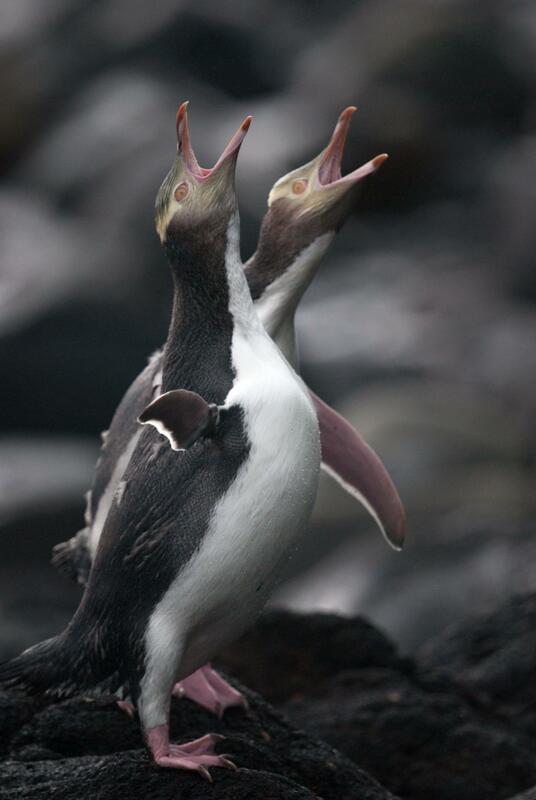 There are estimated to be around 1,700 breeding pairs of yellow-eyed penguins, with the majority of these in the subantarctic on the Auckland and Campbell Islands. 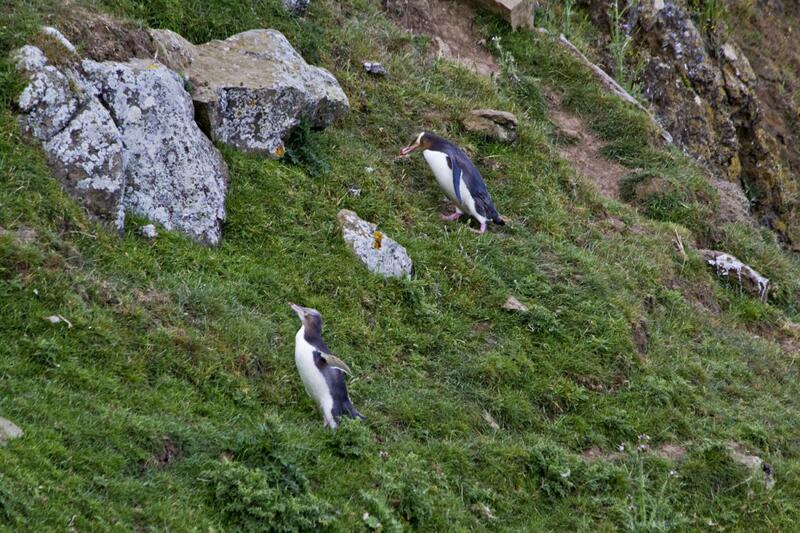 The South Island holds more than 600 pairs, while there are at least 180 pairs on and around Rakiura/Stewart Island. 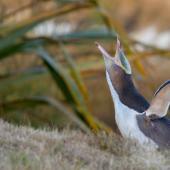 On land, loss and fragmentation of habitat reduces reproductive success through predation, disease, human disturbance, heat stress and hypothermia. 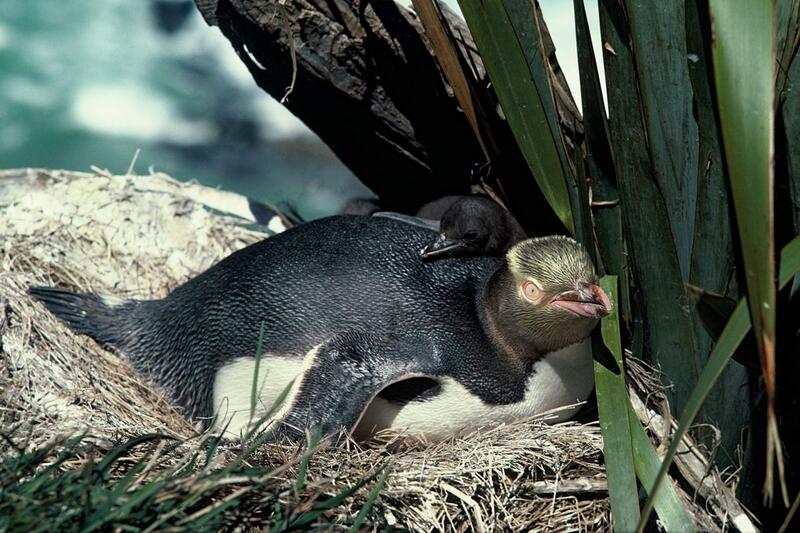 Predation of chicks by a suite of introduced mammalian predators, including feral cats, ferrets and stoats is one of the most significant impacts on yellow-eyed penguins. 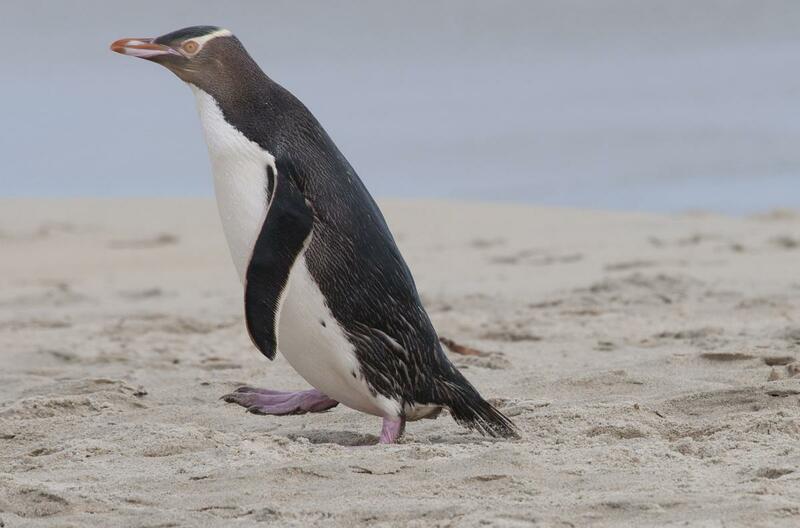 Adult penguins are not at risk from exotic terrestrial predators, except for dogs. 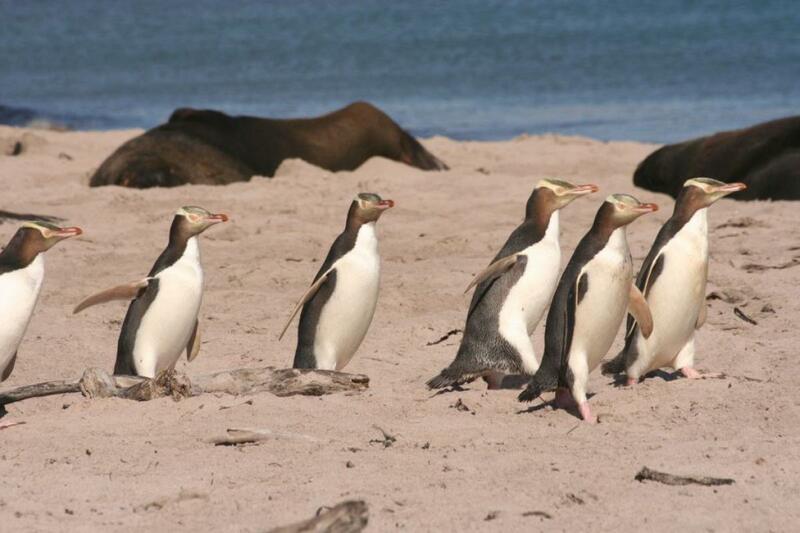 Sharks, barracouta, fur seals and New Zealand sea lions take yellow-eyed penguins at sea. 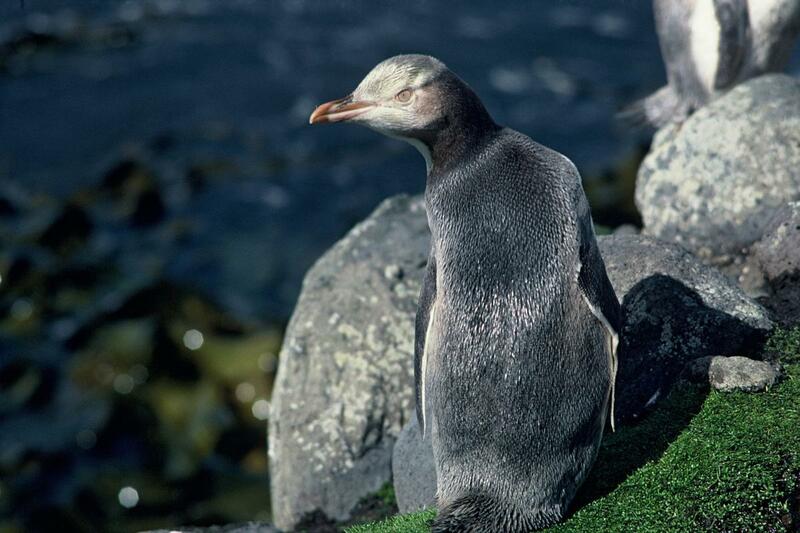 Yellow-eyed penguin adults and chicks periodically succumb to disease. 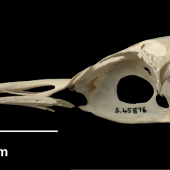 There was a major die-off of adults in 1990, and in more recent breeding seasons young chicks in mainland breeding sites have become infected with a disease described as diphtheritic stomatitis. 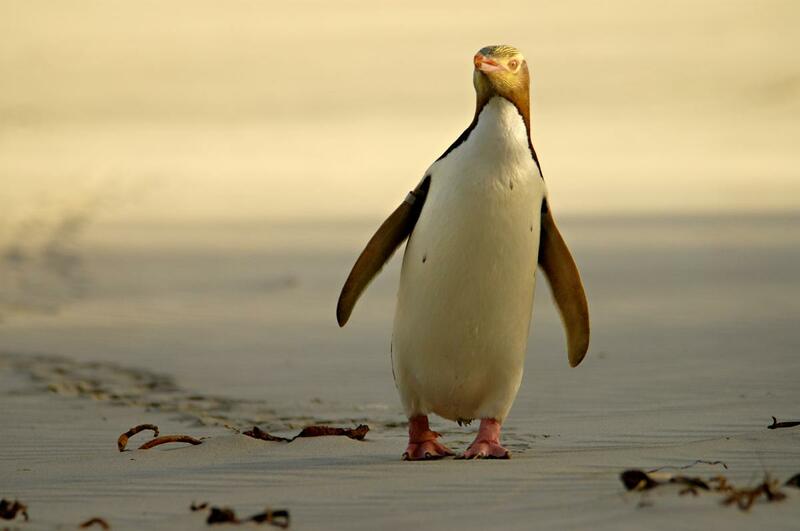 Yellow-eyed penguins are vulnerable to disturbance by humans, although carefully regulated tourist viewing of penguins and low-level intermittent intrusion by researchers does not carry measurable impact. 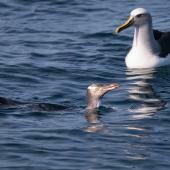 However, unregulated and relatively high intensity disturbance by tourists is associated with reduced breeding success and lower chick weights at fledging, which results in lower first year survival and recruitment probabilities. 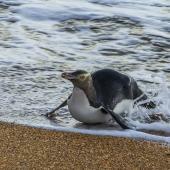 There is no evidence that commercial or recreational fisheries directly reduce prey availability to yellow-eyed penguins, however they do occur as by-catch in inshore set nets. 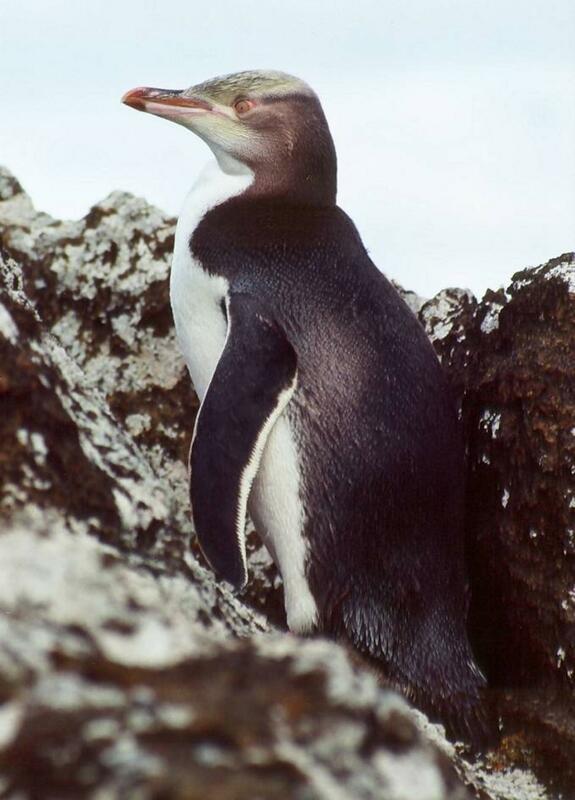 There can be marked inter-annual variation in food supply for yellow-eyed penguins, with intermittent poor food years being marked by reduced numbers of breeding attempts, slow chick growth, higher pre-fledging chick mortality, low chick fledging weights and lower survival of juveniles and adults. 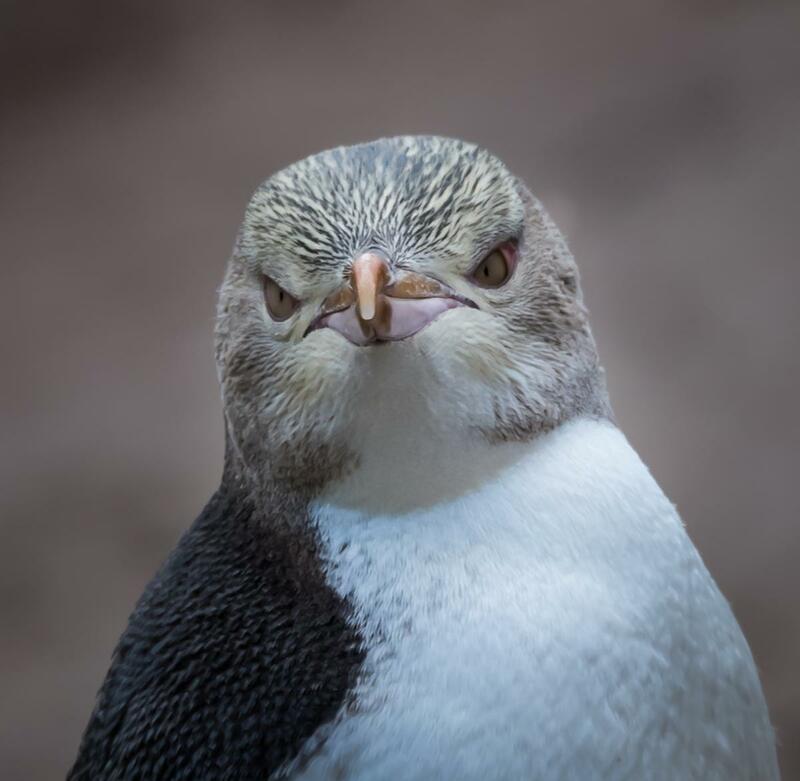 Habitat protection and restoration (including predator control) is managed by the Department of Conservation (DOC), the Yellow-eyed Penguin Trust, community groups, and private landowners. 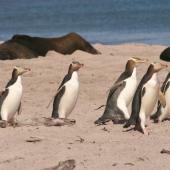 Commercial wildlife tourism takes place on both private land and on DOC-administered reserves. Unregulated visitor access is facilitated with signage and viewing hides. 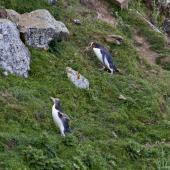 There is regulated seasonal tourist presence at yellow-eyed penguin landing and nesting areas on Enderby Island, in the Auckland Island group. 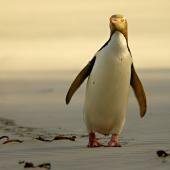 Under DOC authority, privately funded rehabilitation centres serve as collection points for sick, injured or orphaned penguins. They also act as focal points for management responses to periodic disease outbreaks. 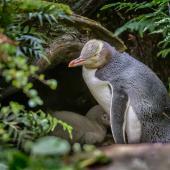 Yellow-eyed penguins select well-concealed nest sites under dense vegetation, with both sexes contributing to nest building. The nest is a shallow bowl of twigs, grass and leaves. 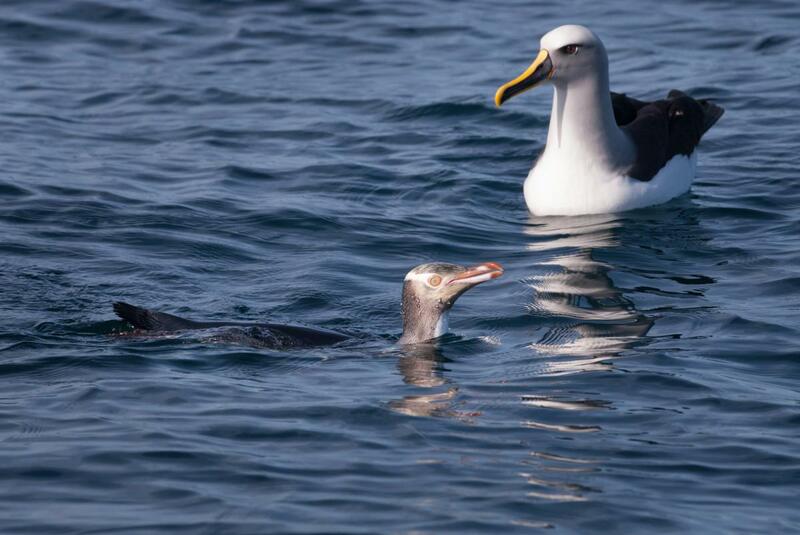 Pairs may be seen together at nests sites as early as July-August. 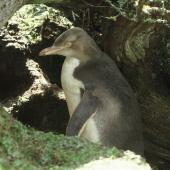 The mean lay date is 24 September on the Otago Peninsula but can occur later at more southern locations. 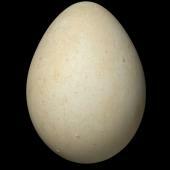 A clutch of two eggs is laid 3-5 days apart. No replacement clutches are laid. 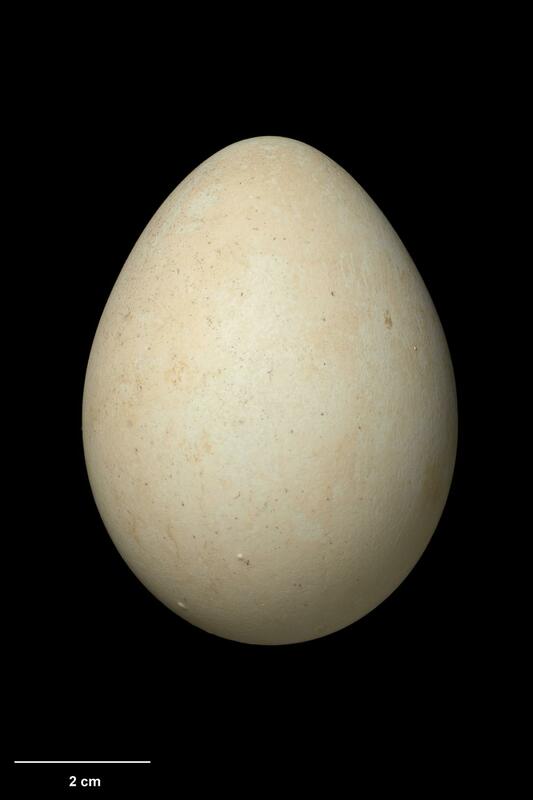 Both sexes incubate the eggs, starting after the laying of the second egg, and so hatching (mainly in November) is synchronous. The incubation period ranges between 39 and 51 days, and is the most variable among penguins. 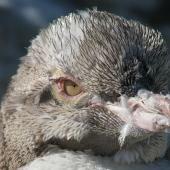 Chick rearing has two phases: the guard phase when the chick is constantly brooded, and the post-guard phase when chicks are left alone at the nest during the day. 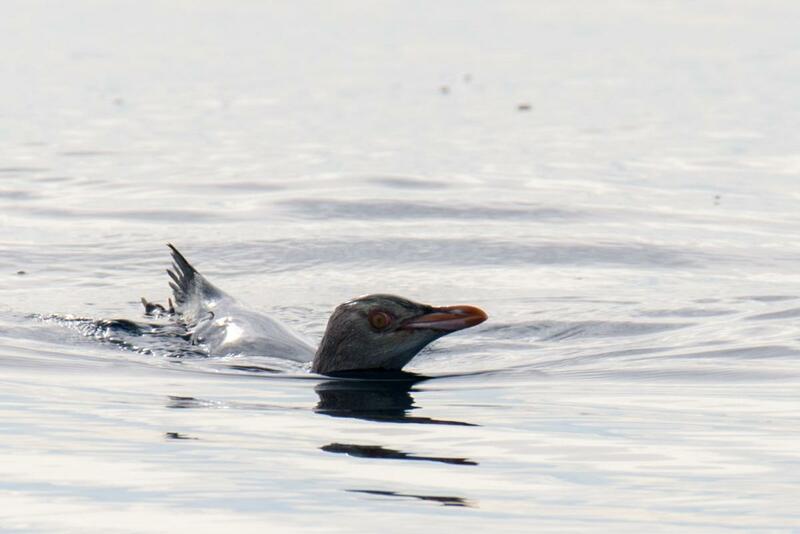 Fledging takes place from February to sometimes as late as April. 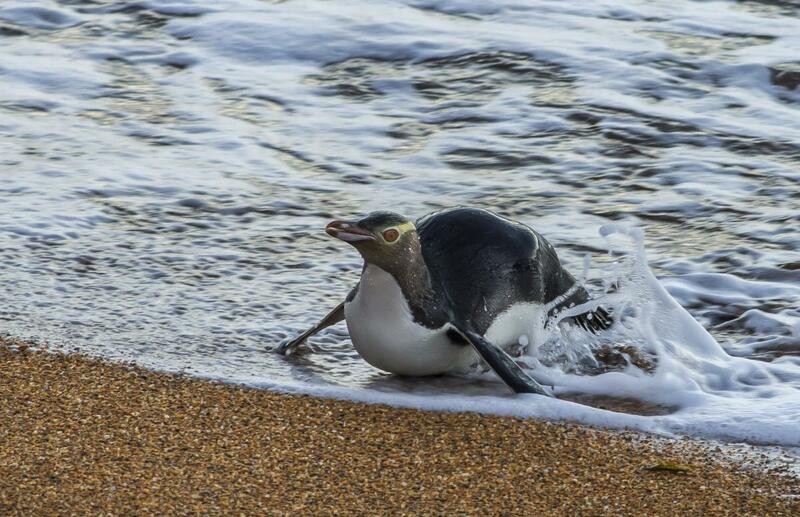 Yellow-eyed penguins forage in the mid-shelf region between 2-25 km offshore, diving to depths of up to 40-120 m to obtain bottom-dwelling fish species such as sprat, red cod, opalfish, ahuru, silversides and blue cod, plus cephalopods and crustaceans. Boessenkool, S.; Austin, J.J.; Worthy, T.H. ; Scofield, P.; Cooper, A.; Seddon, P.J. ; Waters. J.M. 2009. Relict or colonizer? 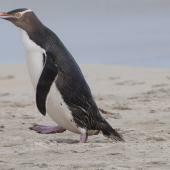 Extinction and range expansion of penguins in southern New Zealand. Proceedings of the Royal Society B 276: 815-821. Cole, T.L. ; Ksepka, D.T. ; Mitchell, K.J. ; Tennyson, A.J.D. ; Thomas, D.B. ; Pan, H.; Zhang, G.; Rawlence, N.J.; Wood, J.R.; Bover, P.; Bouzat, J.L. ; Cooper, A.; Fiddaman, S.; Hart, T.; Miller, G.; Ryan, P.G. ; Shepherd, L.D. ; Wilmshurst, J.M. ; Waters, J.M. In press. 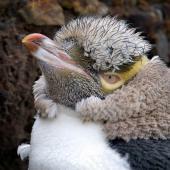 Mitogenomes uncover extinct penguin taxa and reveal island formation as a key driver of speciation. Molecular Biology and Evolution. Darby, J.T. ; Seddon, P.J. 1990. 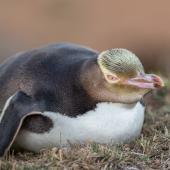 Breeding biology of the yellow-eyed Penguin. Pp. 45-62. 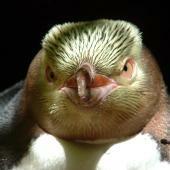 In Penguin biology (eds Davis, L.S. ; Darby, J.T.). Academic Press,Orlando,Florida. Ellenberg, U.; Setiawan, A.; Cree, A.; Houston, D.M; Seddon, P.J. 2007. 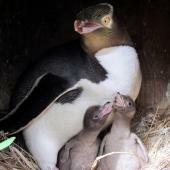 Elevated hormonal stress response and reduced reproductive output in yellow-eyed penguins exposed to unregulated tourism. General and comparative endocrinology 152: 54-63. McKinlay, B. 2001. 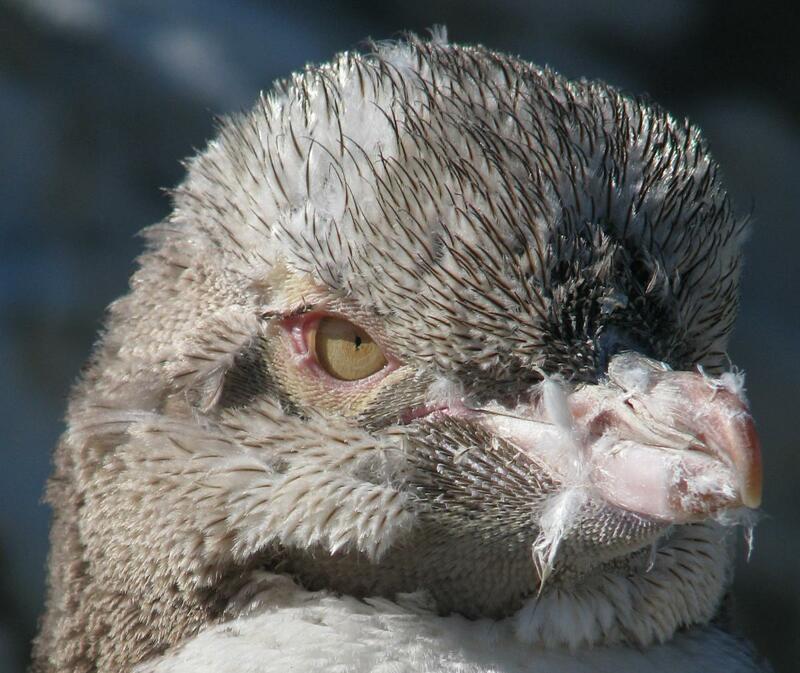 Hoiho (Megadyptes antipodes) recovery plan: 2000-2025. 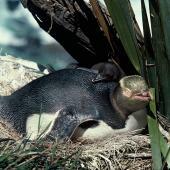 Threatened Species Recovery Plan 35. Department of Conservation,Wellington. Moore, P.J. 2001. 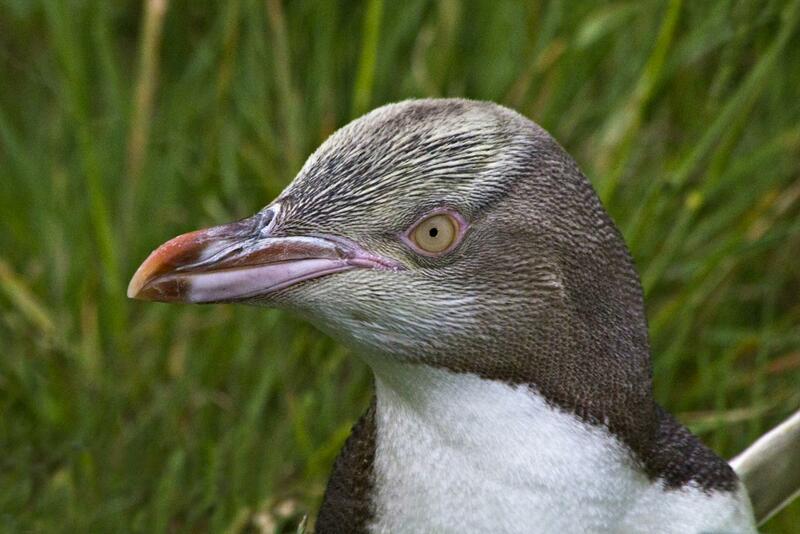 Historical records of yellow-eyed penguin (Megadyptes antipodes) in southern New Zealand. Notornis 48: 145-156. Richdale, L.E. 1951. 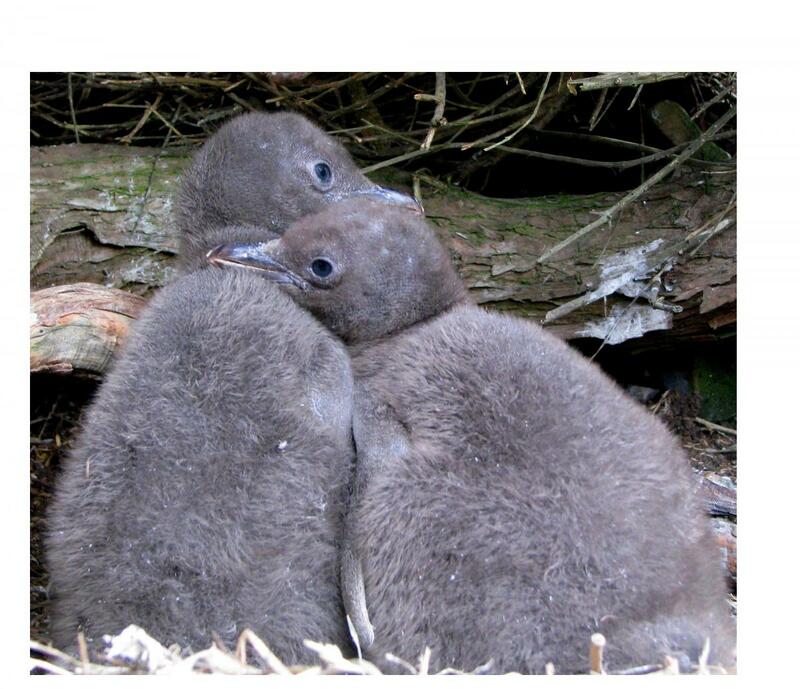 Sexual behaviour of penguins.University ofKansas Press,Lawrence,Kansas. Richdale, L.E. 1957. 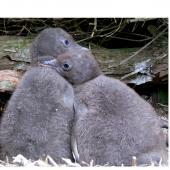 A population study of penguins.OxfordUniversity Press,Oxford. Seddon, P.J. ; Ellenberg, U.; van Heezik, Y. 2012. 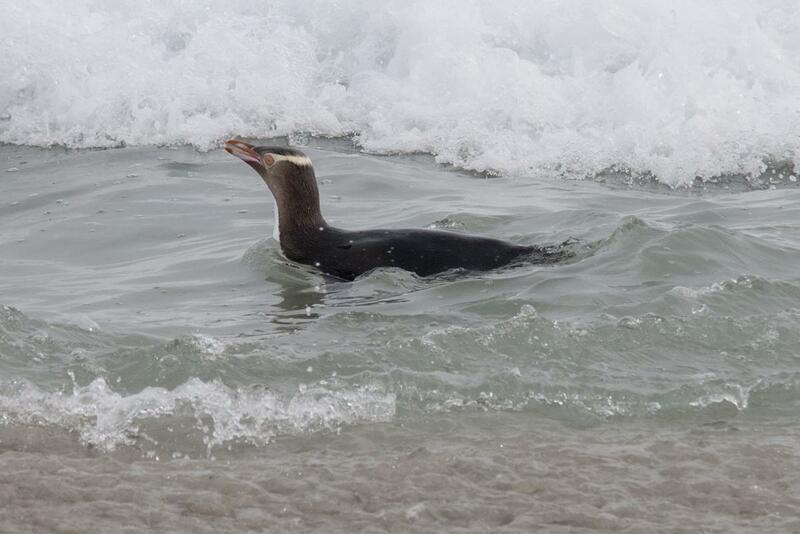 Yellow-eyed penguin. 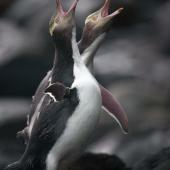 In Biology and conservation of the world’s penguins (eds García Borboroglu, P.G. ; Boersma, P.D.) University of Washington Press, Seattle U.S.A.
Williams, T. D. 1995. 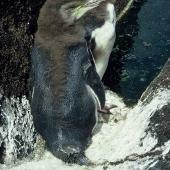 The penguins. Oxford University Press, Oxford. Open shallow bowl made of twigs, grass and leaves. 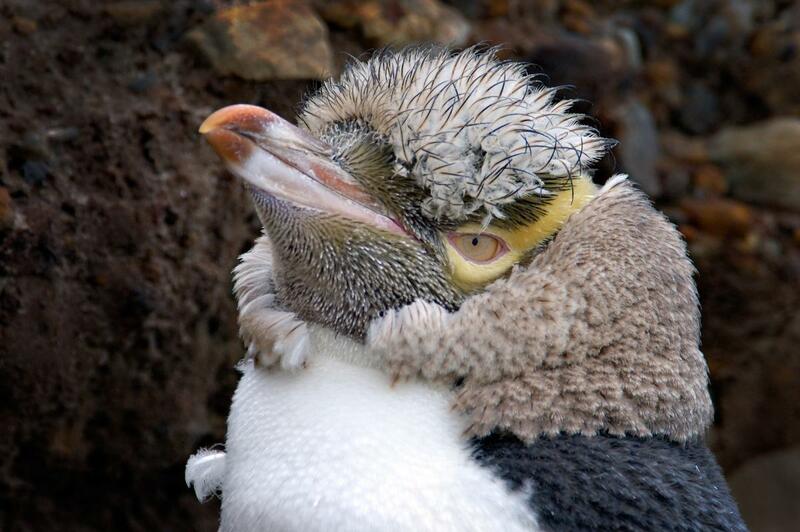 A tall, portly penguin with a pale yellow band of feathers that runs from each yellow eye around the nape, a long straight red-brown and pale cream bill, and pink and black feet. 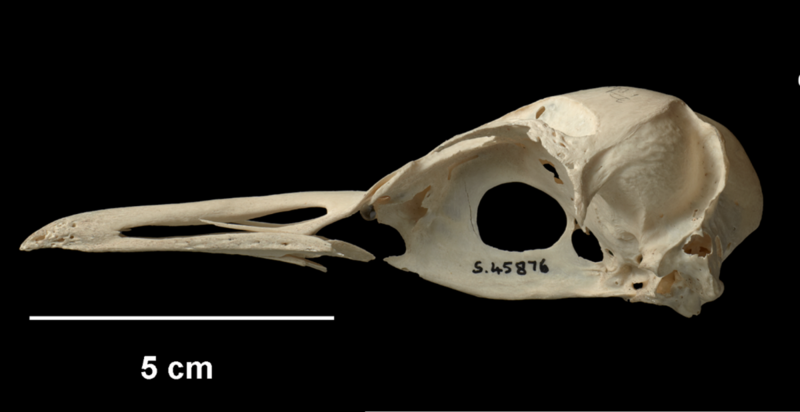 The rest of the head, neck and dorsal surface is slate blue; the breast and belly white down to the feet.